Today I stopped by the University of Liberia, which is situated right between (and across the street from) the massive UN Mission to Liberia (UNMIL) building and the equally large Liberian capital building. I had the chance to sit down with Professors Bropleh, the Associate Dean of Engineering, and Professor Damalo Robert, the Director of Computer Information Systems. It turns out there is no computer science program offered at all. I asked if they knew of any student that was a programmer, if there were any groups that did some type of hacking on their own. Nothing. Below is the sorry story of this saga. 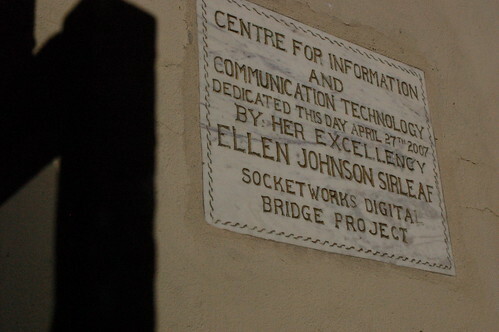 On April 27, 2007 the president opened the new “Center for information and communication technology” at the University of Liberia. It has 150 computers, a VSAT connection and a video conferencing machine. Sounds good! That operation was shut down 6 months ago. The power and the building are paid for by the university, but the nice internet connection cost about $5000 per month and no one was paying the bill. There is some muddy story involving Socketworks Global’s digital bridge project and the International Finance Corporation (IFC), where Socketworks put in a $100k+ expecting to be reimbursed by the IFC, only to have it not happen. What we’re left with is a padlocked door to a 150 working computers, with a dormant VSAT connection sitting unused in the middle of the demographic that could do the most with it. The very same demographic that will be called upon to lead the next generation of government and business in Liberia. Since the war ended in 2003, there has been well over a billion dollars of AID money pumped into this country. It appears as if the young children are more important than the older youth, as almost all education money is funneled to primary schools. On average, out of an engineering student population of 500 students, only 30 graduate. There is a whole generation missing out on real higher education opportunities. 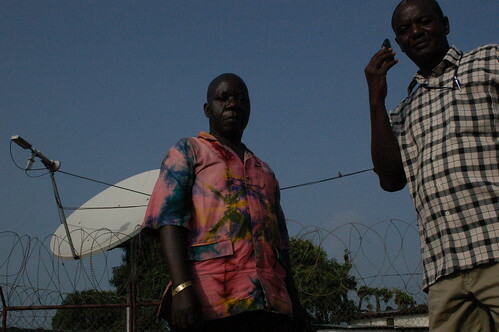 The University of Liberia is an eyesore – a mess of buildings falling apart and crumbling before your eyes. That might be okay though, as the Chinese have built a brand new university complex 30 miles out of town, which is supposed to go into use next year. Maybe they have other plans for this land now, but in the interim, it just seems an embarrassment to the system – both government and aid organizations. We see the big tech foundations dumping their money into all kinds of projects. With a running cost of under $100k per year, why doesn’t some white knight from a big tech company put their money here? Surely this is a place and a project worth that much. That number equates to an accounting error for most of them anyway. I find myself torn between excitement of the potential that these 150 computers represent and the disappointment of the current muck up. Now we want to build something that everybody copies. 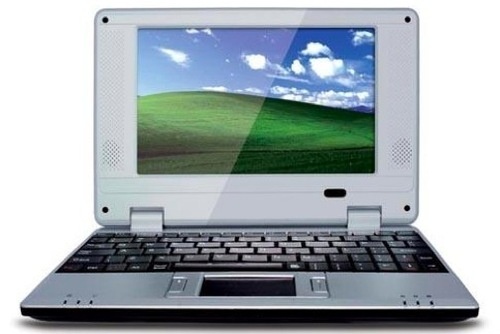 Go from the OLPC to the olpc (lowercase). That’s what’s going to happen over the next 3 years. Open source hardware: where you publish all the specs and all the designs so that anyone can copy it. In a side conversation with Ethan Zuckerman here, this is what they should have done 3 years ago, and it would have saved them a lot of heartache.